US military researchers have presented a new mini-drone, which can be used on civil missions and in war. 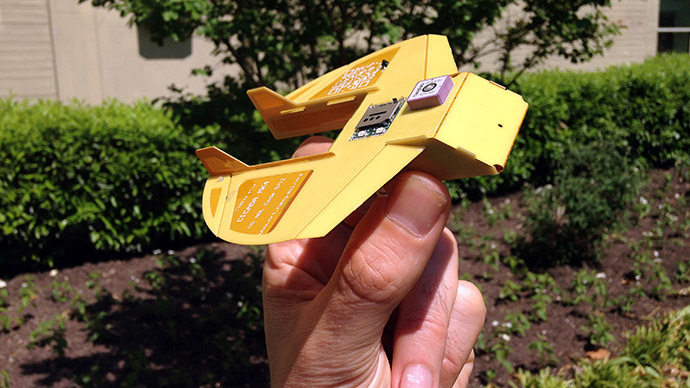 The toy-sized "Cicada" is capable of picking up enemy submarines, or eavesdropping on troops. The “Cicada” or Covert Autonomous Disposable Aircraft, is a GPS-guided, micro disposable air vehicle that can glide like bird, as scientists explain, after being dropped from any aircraft, balloons, or even a larger drone. "The idea was why can't we make UAVs (unmanned aerial vehicles) that have the same sort of profile," Aaron Kahn, a flight controls engineer, from the Naval Research Laboratory told AFP. "We will put so many out there, it will be impossible for the enemy to pick them all up," he added. Despite its relatively tiny size, the drone can fly at about 75kph and is fairly silent, as it has no engine or propulsion system. "It looks like a bird flying down," said Daniel Edwards, an aerospace engineer at the Naval Research Laboratory, adding the drone is "very difficult to see." The prototype cost only $ 1,000 and the price could even be lower – about $250. The minuscule device survived its test flight back in 2011 near the city of Yuma, Arizona - from 17,500 meters. The drone managed to land within 3 meters of its target. The device’s inventors say the miniature drone can be used for many types of mission, from weather forecasting or monitoring traffic to eavesdropping on troops. "You equip these with a microphone or a seismic detector, drop them on that road, and it will tell you 'I heard a truck or a car travel along that road.' You know how fast and which direction they're traveling," Kahn added. The tiny vehicles are surprisingly robust, the researchers say. "They've flown through trees. They've hit asphalt runways. They have tumbled in gravel. They've had sand in them. They only thing that we found that killed them was desert shrubbery," Edwards said. According to the scientists, almost every branch of the US government has become interested in the “Cicada”, including some intelligence agencies. "Everyone is interested. Everyone!" Edwards said.